The Wall Street Journal reports on research from Deutsche Bank analyst Brian Modoff showing that Apple and Research in Motion together accounted for approximately 35% of the mobile phone industry's total operating profit in 2008 while only representing 3% of total unit sales. Apple's share of industry profits clocked in at approximately 20% while holding only just over 1% of the unit market share. The two companies' outsize share of profits underlines the shift in the wireless industry toward feature-rich devices accenting easy-to-use software and away from an emphasis on hardware. Smart phones account for only about 13% of total cellphone sales globally, but the segment is growing, despite a drop in the broader cellphone market. Apple and RIM had about 32% of the smart-phone market between them in the first quarter, estimates IDC. Moreover, Modoff estimates that Apple and Research in Motion will reach a combined 5% of unit sales for 2009, raking in roughly 58% of the total industry profit between them. 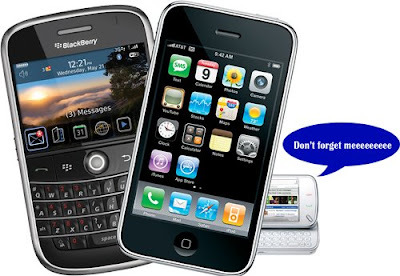 The report notes that wireless carrier subsidies provide the driving force behind such large profits for leading smartphones such as Apple's iPhone and Research in Motion's BlackBerry lines. Apple reportedly receives about $400 in carrier subsidy for each iPhone, while BlackBerry sees about $200 and the typical basic cellphone about $100. Among manufacturers dominating the basic cellphone market, only market leader Nokia is able to leverage its economies of scale to pull in a greater share of industry profits (55%) than its corresponding unit market share (46%). But even Nokia has seen its unit market share and profits slip as customers increasingly adopt more sophisticated smartphone models from smaller competitors.